A brand new feel-good festive romantic serial from bestselling author Rebecca Raisin! 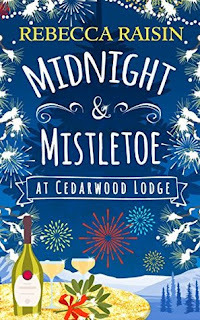 Cedarwood Lodge is a delectable romance told in three parts – following Clio Winters journey back to her hometown of Evergreen. This is the final part. I read this series all at once (Celebrations & Confetti, Brides & Bouquets and Midnight & Mistletoe) with only a short break while I waited for this last installment to come out. I was a bit impatient and even emailed to find out how long I would have to wait for part three! Each book is theoretically a stand-alone novel but if you want to know the full story you really need to read them all. The series takes a woman from her high stress party-planning job to the stars (and almost stars) to the rural town she grew up in to start her own business. It seems as if this is something she’d always wanted to do especially when a building near to her heart comes up for sale. I’ve no idea where she got the money to buy the place- the financial details are a little hazy throughout the books so it’s best to just gloss over them! She has a hard time getting herself set up in the town and simultaneously is trying to re-connect with her estranged mother and fight off an old boyfriend who seems keen to reunite. Most interesting to me though was the actual running of the lodge and the ins and outs of the business. I was really keen on the details and the author gave me enough to stay interested. Clio also manages to drag her best friend out of the city to help her with her new life and I enjoyed their banter, their communication was pretty honest and I really liked that she wasn’t the cookie-cutter type of best friend. The other connections in the novels were good too but that friendship was the most realistic for me. There was also the little matter of her mother’s reluctance to even go near the lodge which I drew me to reading the whole series. Though a good result in the end I found myself more curious about their past and Clio’s childhood and could have used a bit more of the details to really round out their story. Thank you to LRR promos for our review copies. All opinions are our own.